Have you ever looked at a hard to read graph and wished that there was a way to figure out what the precise values of the data were? Or maybe you wanted to extract the data so that you could do your own analysis (or at least produce a clearer graph)? You’re in luck! By having an absolute value on one y-axis, and a percentage on the other y-axis, this graph creates the false impression that unemployment and lack of insurance are both sharply increasing (and that the rate of unemployment has surpassed the rate of lacking insurance). Let’s see if we can do better by producing a more meaningful graph. It looked to me like I had a point on each of the actual data points on the graph, but if not it's easy to keep tweaking them and add / move / remove more points to fully capture the source data. From there we can export the traced data as a text file, and repeat with the second data series. Note that we need to replace the values for the y-axis (in the upper left of Data Thief) before tracing the second line, since the second series uses different units (replace 8 with 50, and 4 with 44). In Excel I multiplied the values for “Uninsured Americans” by a million to get the true number (they are reported in the graph with a unit of millions of Americans). I then got some estimates of US population for Jan 2008 and 2009 (http://www.usnews.com/opinion/articles/2008/12/31/us-population-2009-305-million-and-counting), and used those to calculate an average growth per month, the projected baseline population in Mar 2007, and the projected population for each of our data points. 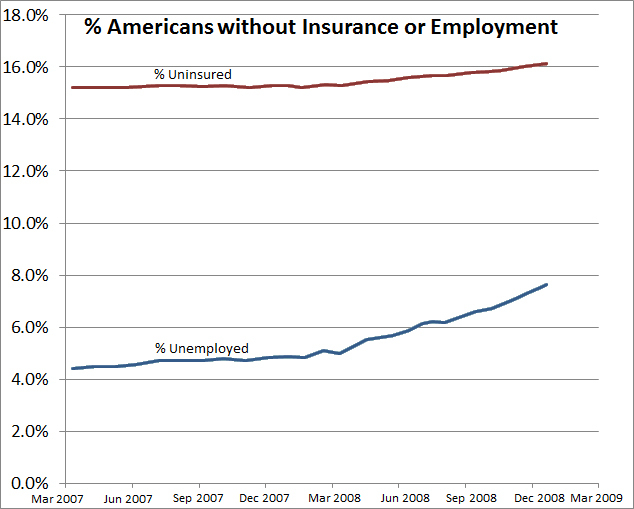 This allowed me to calculate the percentage of Americans who are uninsured, to allow us to compare that to the percentage of Americans who are unemployed. There are two important considerations before using this software. First, these values will only be approximate, so if possible it’s always better to get the underlying data from the person who created the first figure. Second, it is possible that the data you are extracting is copyrighted, and that your reuse of their data may violate the data license. Use at your own risk! A third potential problem is that you may find yourself sucked into "fixing" misleading graphs you find on the internet, which is a task you will never complete. Note that despite the name, DataThief is shareware; if you find it useful, please put your thieving on hold long enough to buy a $25 license. NOTE: If you're working with a bar chart or other figure where tracing a line isn't necessary, once you set your three axis points and enter the value range for x and y (by updating Ref 0 with 0,[high range of the bar chart], setting Ref 1 to 0,0, and setting Ref 2 to [any value],0), you can simply drag one of the circles with a + in it around to the end of each bar and record the value displayed as you drag it. Especially for a small chart with just a few bars I find this quick and easy.